Last week when I saw 'The Boss', I thought I was certain to not see a movie just as bad or even worse. But along came 'Gods of Egypt' to do it best to give it a run for its money and to try and claim the title for itself. Horus (Nikolaj Coster-Waladau) is set to become the new ruler of Egypt as his father Osiris (Bryan Brown) steps down. 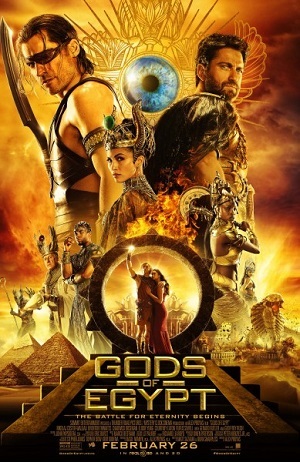 Osiris' brother, Set (Gerard Butler) who was cast out to rule the desert comes back in what seems to be to see the coronation but kills Osiris and blinds Horus to take the throne for himself. A mere mortal Bek (Brenton Thwaites) loses his lover Zaya (Courtney Eaton) when trying to escape slavery from Set and looks to help Horus in return for him bringing back Zaya. 'Gods of Egypt' takes us to Egypt where absolutely no one looks or sounds Egyptian, at least none of the main characters do. The cast consists of Australians, Europeans and Americans with not many even liking slightly Egyptian at all and it does cause quite a problem. This automatically takes you out of the film as all these characters don't fit the setting at all. On top of that, most of them speaking in what are more British accents than anything other than Gerard Butler who goes all out in his Scottish voice. The film has came under fire a lot for it's terrible casting and it does affect the film a lot. How do they expect us to believe these characters and settings if they haven't even bothered to get even one actor from Egypt or Egyptian descent to appear in it? One of the biggest problems with the film is just how bad the writing is within this film. The story for one, is not interesting. The characters also are not interesting and thy don't get you even remotely emotionally invested in any of them. The combination of they two alone is a crime for a movie because if you fail on that, what else do you really have to stand on? Oh yeah, it's the CGI that they want you to only care about. To make things even worse the dialogue is insufferable. I have no idea to why they tried to make this huge film and have everyone try to be funny. It doesn't work at all and it is so cringey seeing these awful characters come out with one liners. The character Bek becomes the worst in the film for this as he cannot help but make some sort of remark regardless of what is happening, even if he is staring in the face of death. The other part of that character's dialogue is him constantly asking questions and is one of the worst written characters of the year. As previously mentioned, the film is a complete CGI fest. There are literally no scenes that are organic or believable at all. The CGI at times is fairly impressive as it creates some huge settings that do like quite nice. However there are so many things that look awful especially for a feature length film that had a budget of $140 million. They obviously were trying to create something epic but it is just shockingly bad with the gods being twice the size as normal humans, yet have the same features. The fight scenes become unbearable as the gods turn into bulls or eagle like creatures that are eyesores. Unfortunately for the film, none of the creatures look good at all. None of them make you go wow or even impress slightly. The worst of all comes in the form of the sphinx that will let you past if you can solve a riddle. Great stuff. There are so many things that happen in the film that are just convenient. Again we go back to the character Bek, who gets away with everyone at the very last second. No matter what happens, he's always safe for no other reason. There is a scene where Bek and Horus are being pursued by two large -and awful looking- fire breathing snakes n which the pair go into one of the gaps in the ground. Whilst sitting in this square in the ground the snake approaches them and starts to breathe it's fire towards them. Only a few seconds ago, the huge creature was sending flames for thousands of metres. However when it came to actually causing destruction, it could only power out enough for 3/4s of the small area and conveniently, that's where our 'heroes' were. Along with constantly being oh so lucky, the characters get a whole lot of help from characters who also possess magic skills. They only do so when danger is near and to allow the story to progress. You then start to question why all these "powerful" gods didn't just team up to take down Set, rather than letting him run amok with a reign of terror. The run time of this movie is 2 hours and 8 minutes. Now with no good story, no good writing, no good characters, how on earth do they expect you to be entertained for more than 2 hours? This film undoubtedly should have been a lot shorter as it didn't have nearly enough quality to last that long. In saying that though, the film doesn't have enough quality for one hour. An utter shambles of a movie, 'Gods of Egypt' is up there with the worst of the year. So have you seen 'Gods of Egypt'- and for your sake I hope you haven't- what did you think of it? If you do choose to see it albeit I highly recommend you don't, I hope you enjoy it more than I did. Once again, thank you for reading my review, it is much appreciated!